This magnificent structure, just completed, on the corner of State and Quincy streets, and now open for the reception of guests, is one of the most elegant and elaborate hotel edifices in the United States, as will be readily seen from the accompanying engraving. It is seven stories high, built of Cleveland stone, and presents a most attractive appearance. Internally this immense Caravansera is fitted up in a style alike luxurious and tasteful. The most superb carpets cover the drawing-rooms, and furniture of unique model meets the eye at every turn. Mr. Meserve, the proprietor, has displayed taste and judgement in his fittings throughout, and the “Palmer House” is destined to rank at once as the first hotel in the country. The different floors are easily reached by means of a large elevator, which is to be kept constantly running, rendering the upper stories equally desirable with the lower, while the view is unequalled in the city. Most of the apartments have a southern exposure, and Lake Michigan stretches away from their windows in a blue expanse. The avenues are seen to run straight out into the open country, and the whole lookout is charming. Every part of the hotel is in constant communication with the office by means of telegraphs and signals, which renders the spread of fire next thing to an impossibility. In the erection of this magnificent structure, State street real estate has been enhanced in value, and its locality redeemed from the small class of buildings which formerly stood on its site. When finally thrown open and ready for guests, as it will be by the time this journal is issued, it will be the cynosure of the traveling public. Mr. Meserve, the proprietor, is a gentleman of enlarged hotel experience, and will make the “Palmer House” a hotel deserving the name. Opening of the Palmer House. Not less than five thousand of our citizens, accompanied by their wives and daughters, paid a visit of inspection to the Palmer House, on State street, at the opening yesterday afternoon and evening. Had the occasion been a reception of the dignitaries of the nation, it could not have been more fashionable, and as an attendance on an opening, it was certainly worthy of the finest hotel in the West. The Palmer House is certainly the model caravanserai of Chicago, and more than equals the anticipations of our citizens, who expected something choice and elegant at the hands of the projector. Perhaps it is not the equal in accommodations of some of our larger hotels, but in its appointments it is certainly superior. It is doubtful if the parlors of any hotel on the continent are so handsomely—even gorgeously—appointed, and the general accessories are on a par with this feature. It is, of course, provided with all the modern improvements, noticeable among the which is its smoothly gliding elevator, which ascends from the basement to the topmost floor. After the general reception, the members of the press were invited by the proprietor, Mr. Meserve, to an elegant repast in the ladies’ ordinary, prepared by Charles M. Smith, the well-known cook. There is no doubt that the hotel is a grand success, and the traveling public will endorse the opinion. 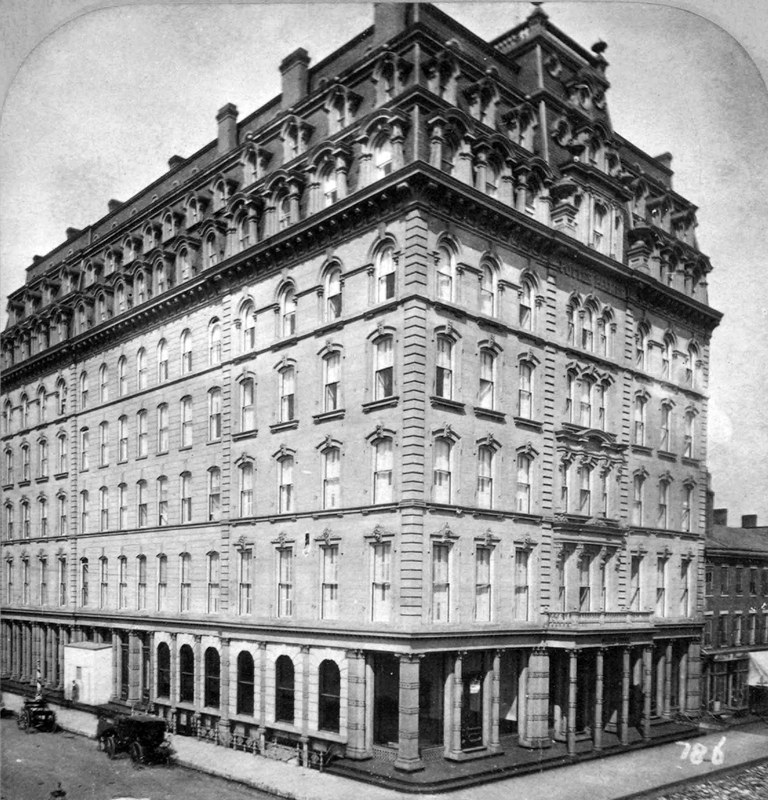 Yesterday evening this new hotel was thrown open for inspections, and was visited by thousands who, while admiring all, found nothing more worthy of note than the spacious and elaborately furnished parlors, the chief charm of which conslated in two very fine pianos—one grand and one square—from the celebrated factory of W. Knabe & Co. They were played upon by several competent judges, who pronounced them noble instruments, especially the grand, which filled the large rooms with its powerful, yet sympathetic and sweet tones. They were obtained from J. Asner & Co., 69 Washington street, the sole agents for these pianos. The ruins of the first Palmer House. The people at the Palmer House thought the hotel opened in 1871 and not 1870. The confusion arose in that there was a SECOND Palmer hotel under construction at the time of the Great Fire on the corner of State and Monroe. Today, a Chicago symbol will put a 100th candle in its birthday cake, kicking off a week-long celebration commemorating the day Chicago pioneer Potter Palmer first opened the original version of the Palmer House. Located today at State and Monroe Streets, the original and ill-fated-hotel was on the northwest corner of Quincy and State Streets. 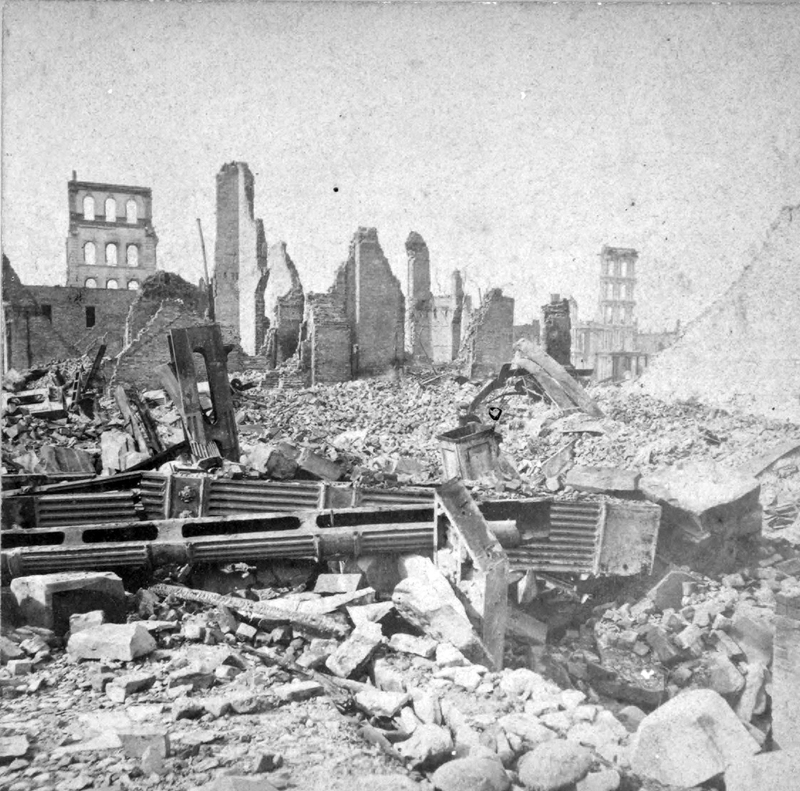 Opening for the first time on Sept. 26, 1871, the Palmer Hotel, as it was then known, perished thirteen days later in the Great Chicago Fire. 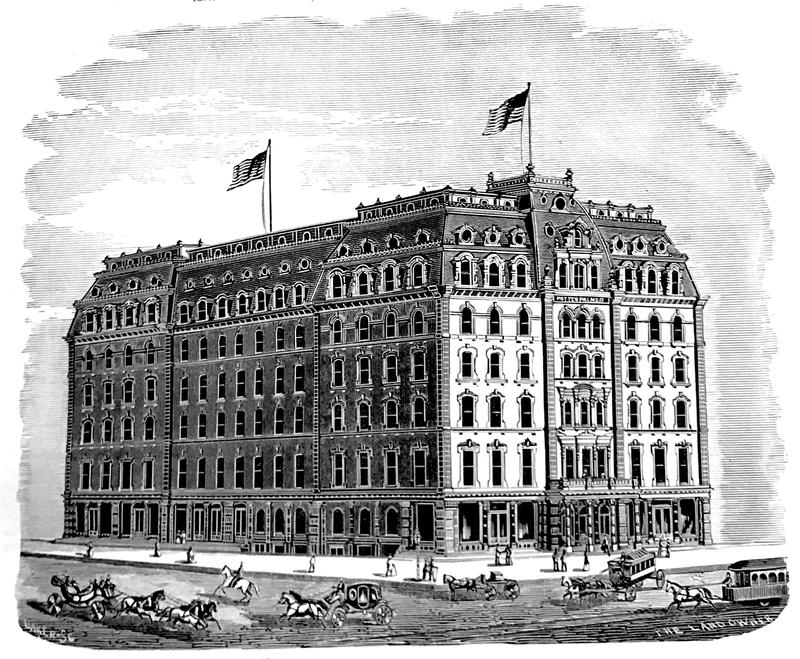 But undaunted, Palmer rebuilt the hotel on its present location and opened it to the public in 1873. The second version cost $2.5 million, had 850 rooms and sported a first floor barber shop with 300 silver dollars imbedded in its floor. Today, it would take six years to sleep in each of the hotel’s rooms if a different pillow was dented each night. The Palmer House now has 2,260 rooms, enlarged by the Palmer estate in 1925 at a cost of $20 million. U. S. Grant was President when the original Palmer House opened and was a dinner guest in its post-fire edition a few years later. James Garfield and Grover Cleveland learned of their nominations in the hotel and William Jennings Bryan and William McKinley campaigned in its lobby. Mark Twain entertained dinner guests with his jokes there and Rudyard Kipling and Oscar Wilde commented in their works about the hotel’s sumptuous barber shop floor. When the hotel was rebuilt in 1925, crews worked 24 hours a day with guests being moved to one section while workmen worked on another. It was the first Chicago hotel to have telephone service in all its rooms, electric lights, air conditioning and elevators. The Palmer House was sold to Conrad Hilton in 1945 for $20 million. The centennial celebration will begin today with a recep- tion, and all week there will be historical memorabilia on display at the hotel collected from past patrons from all over the world and loaned by the Chicago Historical Society. The Palmer House, State and Monroe Streets, will celebrate its 100th anniversary. Another Chicago centennial was observed last year, and a surprising historical detail was brought to light. In response to a reference question, our library staff prepared a report on the Palmer House, which celebrated its hundredth anniversary with much fanfare last year. Our research showed that, in effect, the hotel had celebrated its centennial a year too late. A copy of the report was sent as a courtesy to the hotel’s general manager. His thank you letter was a model of restraint, promising to correct the records. Presumably the situation will be rectified—in another 99 years. This column was one of those that hailed 1971 as the centennial of the Palmer House, a hostelry we love. But nobody in the press has exposed the miscalculation, and it might as well be us. According to the Chicago Historical Society, the Palmer House opened in 1870, not 1871.